The under-development Bose AR sunglasses will send sound directly to users’ temples. Renowned audio technology brand Bose is a company many users recognise for its noise-cancelling airplane headsets. It is making its foray into the domain of high-technology sunglasses. The device is known as Frames and it will offer ample opportunities for the implementation of the latest software. The Bose Frames will function similarly to Bluetooth earbuds. The section of its frame that is close to the wearer’s ear can play music, receive calls and function with voice assistant technology. Frames can be controlled through a microphone and a multipurpose button, which are both ingrained in the right temple region. The initial Frames devices will start selling from January 2019 for a retail price of $199. Each Frames device is equipped with audio features, a battery, and parts to facilitate connectivity. Additionally, it also contains a nine-axis motion sensor. Data collected through the sensor is combined with the GPS on a user’s phone. This aids Frames in determining the view a user is getting, fundamentally for AR uses. A prototype version of Frames was available for test usage during March 2018. As users walked around with the glasses on and look at a particular building, he/she would also tap the right temple portion of the Frames. In response, a voice command would inform the user regarding the building, and even the name and business hours, if it is a commercial establishment. According to Bose, companies like TripAdvisor, Strava and Yelp are set to develop software geared for use with the Frames. 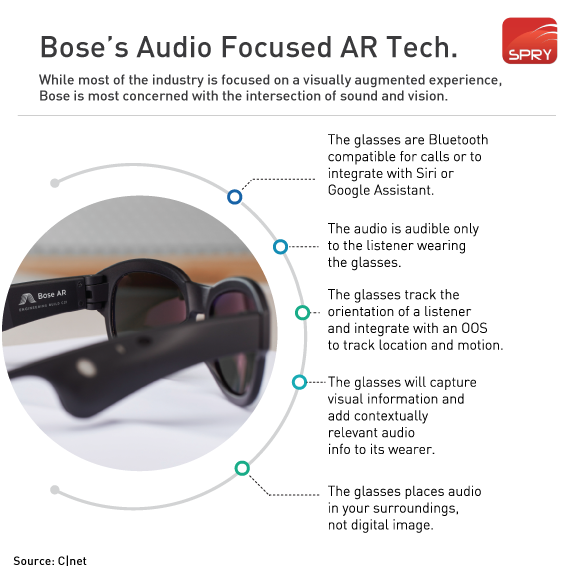 The platform on which software will operate is known as the Bose AR, which aims to make considerable strides in the domain of augmented reality. The Bose AR experience is tailored in a way that users are not required to point and hold their smartphones over whatever they are observing. Certain users described the experience of the brief test session as being lead by a preeminent tour guide who responded to their commands. Frames by Bose do not have a camera or lens on them, and no one can charge their wearers of secretly filming them. It is a calculated decision based on the unfavourable reactions to the camera-equipped Google Glass devices. Users can choose from either of two Bose Frames, one in a rounded style and another with a square frame shape. The glasses are designed to keep out up to 99 percent UVA/UVB radiation rays. The device will weigh 45 grams and contain gold-plated hinges. A pogo pin cord, similar to the ones used on Apple laptop and Snap Spectacles, has to be used for charging the device. Users can get 3.5 hours of non-stop audio playback, and a standby time of up to 12 hours. A pair of Frames will take two hours to charge. Bose has expressed that users can expect amazing and pristine audio clarity from the device. The company will release further news during developer software during March 2019. Visit the website here fore further information.